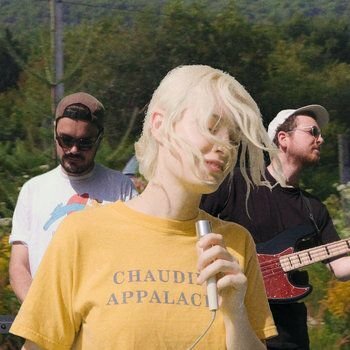 Falling somewhere within the blurry, overlapping boundaries of alternative rock, bedroom pop, and ambient R&B, the Canadian indie trio Men I Trust take pride in their reluctance to neatly adhere to any one genre. “We just don’t want it to be, like, a fad or a fashion,” keyboardist Dragos declares, emphasizing the importance of making music that is “good on the long-term.” The trio infuses each song with their unique, self-taught style of production, and have racked up an impressive discography of songs. The crowds at their shows aren’t solely made up of young people desperately seeking out the newest trend. Rather, they tend to consist of people of all ages and backgrounds, something Dragos, Emma, and Jessy consider a marker of their success. Their last LP Headroom may have dropped in 2015, but Men I Trust have been nothing if not busy these past few years. Between selling out tours, releasing three popular singles in the past year alone, and working on their third full-length album, which is set to be released this year, the group has had few calm moments in recent memory. Luckily, however, they found some time between shows to speak a little bit about their artistic influences, the importance of longevity in their music, and the cities they enjoy touring in (hint: their favorite Lana del Rey song is “West Coast”). Transcription of interview, edited for clarity. Unless otherwise marked, all responses given by Dragos. In the past, when asked to name a good “Romantic Record,” Emma responded with “anything by Lana del Rey.” For all the die-hard Lana fans in the world, including myself, I was wondering which track of hers was your go-to? Well, mine is definitely “West Coast,” but I can ask Emma… “West Coast” too for Emma. I think it’s all of our favorite. It’s just so good, and the music video is beautiful too. On your website, it says that longevity is a prominent theme in your music. Would you be able to elaborate on what that word means for you? Of course… originally, that sentence was written by a German reviewer of our music, and I thought it was very beautiful, the way she put it, so it isn’t our own description. But, I would say, we just don’t want it to be, like, a fad or a fashion, you know? We want it to be something that’s good on the long-term, and that isn’t just attached to a trend. And, I would say, another aspect of longevity would be, don’t think you ought to have a following or a crowd that is made of young people. Often, at our shows, there’s also, like, older adults, you know? Like fathers and mothers, even grandfathers, and much younger people too, at the shows that are open to all the public… that’s something that we’re very proud of, and we’re very happy to have, you know? I’d say longevity in that sense is not just, like, good chord progression, lots of storytelling, and melody, that is attached, you know, to just trends, but that is not just specific to, you know, one group of age that can appreciate it… so yeah, that’s why I would say longevity is very important. That’s a great answer. Are there any other themes that you tend to come back to when you’re writing music? A common theme that pops up in a lot of your music, especially in music videos, is nature, and wanting to be closer to nature. When you sing about being a “country dog” in a big city, for example. What’s it like to be a successful artist, touring in all these big cities, and traveling all the time, while singing about being close to nature? I can imagine it must be hard to find time to go out into nature while always traveling. It is, but we spend lots of time on the road and, especially in the United States, there’s so many landscapes, and different types of farmland… we often just stop and just like to get something to drink, or take some pictures, or just take some time to walk. But, especially up in Canada, when we are not touring, when we’re not being in cities, we’re in a very, very small city of, like, one thousand people. So, you know, it creates a balance of, like, being in a city, seeing lots of people, having bars. But, at the same time, we also have the isolation, you know, for songwriting, or just for being alone. Definitely. I feel like that’s something I can relate to personally, and I feel that a lot of your listeners can relate to that. It’s very nice to have that. You know, at the same time, we get isolated all the time living in a small town. We still have the Internet to keep connected with the world, but it’s very exciting to be in a city, where there’s lots of projects… there’s always new ideas and stuff that it’s very good to be around, so… I think, yeah, it’s about that balance. Do you personally have a favorite city that you really like touring at, or going back to? Yeah, I think we all like very much living in California. We really like L.A. and San Francisco, but we also like the other Northern States on the West Coast. We really like Portland… yeah, stuff like that. So you’re a lot more of a West Coaster? Yeah, but at the same time I really like Texas too, and I like New York. I think we pretty much all enjoy California a lot, especially in the Winter, because in Canada it’s so cold and we like to go where heat is. It’s more energizing for us. I heard that you’re going to be releasing a new album soon. Is that correct? This is going to be the first LP you’ve released in a while. Is there anything you’re trying to do differently with this one? Like, is there going to be a coherent theme, or is it going to be a more loose collection of tracks? In general, I’d say… like, with the album, just because of the format of the album, you’re allowed to wander off, you know, a bit off course, so some of the songs are more like UFOs. That’s the thing about an album, because it’s all done at the same time, there will be similarities, just because of the instrumentation, the sounds we make… it’s nice to be able to have, like, more of a structure, but also to be able to wander off and do some more experimental stuff. Your music is hard to box into one genre, I feel like it kind of transverses the boundaries of a lot of common genres. We all feel that too. And it’s definitely also changed over time, and I was wondering if you could tell me a little bit about your musical inspiration. Do you have artists that you think about when you’re writing songs, or does it come from a more internal place? I would say, like, we think of artists when we do… when we do music, we’re thinking about, you know, that storytelling stuff, and storytelling, what happened, chord progression, and melodies… of course, we all have musical influences. Jessy comes from a jazz background, Emma likes more of a, like, large rhythm, and, like, cool stuff, you know? It all comes together when we all just put our thought sheets on the end. So, to wrap up, you guys were contacted personally by Tyler, the Creator, who is apparently a huge fan of yours. Can we be expecting a joint project anytime soon? Yeah, we tried to collaborate on one song… he’s a very busy guy, I think he must have, like, hundreds of messages every day… but that’s something we want to do. Well, I’ll be looking out for that. Thank you so much, Dragos! Lucas Mitchell is a DJ for The Darker Side. Tune in to TDS from Saturday 9pm to Sunday 7am!